Decades of scientific research into cognitive psychology and the brain have given us knowledge about language, memory, motor skills and perception. We can now use that knowledge in robots, but Frank van der Velde's research goes even further. "The application of cognition in technical systems should also mean that the robot learns from its experiences and the actions it performs. A simple example: a robot that spills too much when pouring a cup of coffee can then learn how it should be done." The arrival of the iCub robot at the University of Twente should signify the next step in this research. Van der Velde submitted an application together with other UT researchers Stefano Stramigioli, Vanessa Evers, Dirk Heylen and Richard van Wezel, all active in the robotics and cognitive research. At the moment, twenty European laboratories have an iCub, which was developed in Italy (thanks to a European FP7 grant for the IIT). The Netherlands is still missing from the list. Moreover, a newer version is currently being developed, with for example haptic sensors. In February it will be announced whether the robotics club will actually bring the latest iCub to the UT. The robot costs a quarter of a million Euros and NWO (Netherlands Organisation for Scientific Research) will reimburse 75% of the costs. Then the TNO (Netherlands Organisation for Applied Scientific Research) and the universities of Groningen, Nijmegen, Delft and Eindhoven can also make use of it. Within the UT, the iCub can be deployed in different laboratories thanks to a special transport system. The possibilities are endless, according to Van der Velde. "The new iCub has a skin and fingers that have a much better sense of touch and can feel strength. That makes interaction with humans much more natural. We want to ensure that this robot continues to learn and understands how people function. This research ensures, for example, that robots actually gather knowledge by focusing on certain objects or persons. In areas of application like healthcare and nursing, such robots can play an important role. A good example would be that in ten years' time you see a blind person walking with a robot guide dog." A recent line of research that is in line with this profile is the development of electronic circuits that resemble a web of neurons in the human brain. Contacts have already been made to start this research in Twente. In the iCub robot, this can for example be used for the robot's visual perception. This requires a lot of relatively simple operations that must all be performed in parallel. This takes a lot of time and energy in the current systems. With electronic circuits in the form of a web of nerve cells this is much easier. "These connections are only possible at the nanoscale, that is to say the scale at which the material is only a few atoms thick. 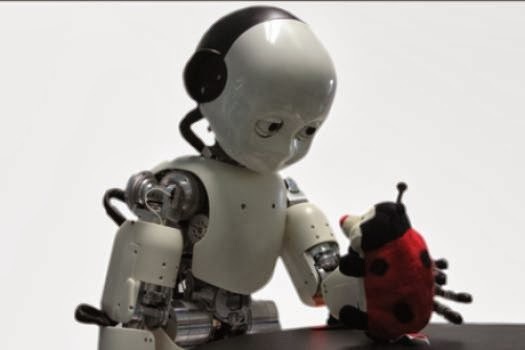 In combination with the iCub robot, it can be investigated how the experiences of the robot are recorded in such materials and how the robot is controlled by nano-neural circuitry. The bottleneck of the existing technical systems is often the energy consumption and the size. The limits of Moore's Law, the proposition that the number of transistors in a circuit doubles every two years through technological advances, are reached. In this area we are therefore also on the verge of many new applications."